Everyone is probably familiar with today's famous water parks like Zoombezi Bay and Kings Island, The Beach, and Great Wolf Lodges, but did you know that Columbus once had it's own water park? 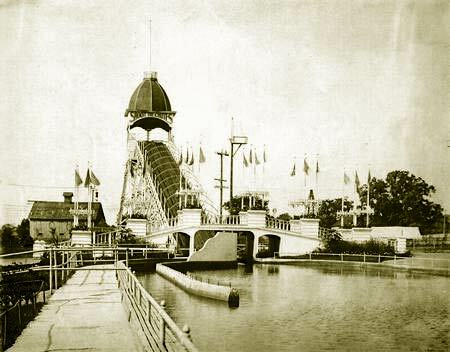 The property occupied today by Olentangy Village was once an amusement park. The park was first called The Villa and was opened in 1893 by Robert Turner. 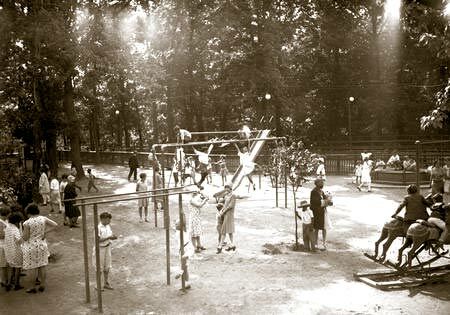 In 1896, the Columbus Street and Railroad Company bought the property, renaming it Olentangy Park. It quickly gained renown as one of the city's most beautiful spots. In 1899, the Dussenbury brothers purchased the park, which then featured a small merry-go-round. The Dussenburys built a theater, dance pavilion and rides such as the loop-the-loop, whirlwind and shoot the chutes. During the 44 years the park was open, it featured 4 roller coasters (Red Devil, Racer, Figure 8, and Whirlwind), the Ye Olde Mill, a swimming pool, 2 Ferris wheels, a pony track, a train ride, 2 carousels, and many more attractions. A spacious Dance Hall was constructed along the Arcade, and throughout the Park's life the Dance Hall would bring Columbus residents performances by virtually every Big Band of the era, including Jimmy Dorsey, and The Glenn Miller Orchestra, as well as many famous comedy and vaudeville acts. An open air amphitheatre was built near the theatre allowing local Brass Bands to perform open air concerts. By the end of the 1910s Olentangy Park had become the largest amusement park in the United States, dwarfing other trolley parks, such as Pittsburgh's "Kennywood," and even Sandusky, Ohio's now famous Cedar Point. In 1938, the park was sold to L.L. LeVeque, and turned into the Olentangy Village apartment complex. 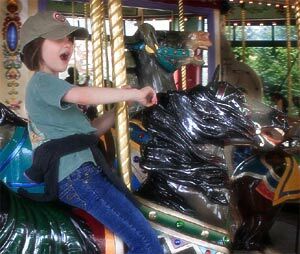 Today the only reminder of the park is the swimming pool at Olentangy Village and the original Grand Carousel that is now located, and in regular operation, at the Columbus Zoo & Aquarium. The Jeffrey Manufacturing Company, in Columbus made the Spur Haul Up Chain used to power the Figure 8 roller coaster at Olentangy Amusement Park. The cost to ride was five cents. The park was located on North High Street along the Olentangy River.